♦ TONIGHT! Wednesday, May 10 – Jim Sisko’s Bellevue College Jazz Orchestra Performing at Tula’s Jazz Club | 7:30 pm | $10 cover charge. ♦ TOMORROW! Thursday, May 11 – Shirley Cunningham’s retirement party. R 101 3:30 – 5:00. Read More about Shirley’s retirement. ♦ Saturday, May 13 – WRITE ON! | 7:30 pm | Carlson Theatre, Free Admission. View more info on the Performing Arts web site. ♦ The Corporation of Yaddo has awarded English Instructor, Martha Silano, an artist’s residency in literature. She will spend two weeks at Yaddo this spring, working on a full-length collection of poems. Congratulations Martha!! 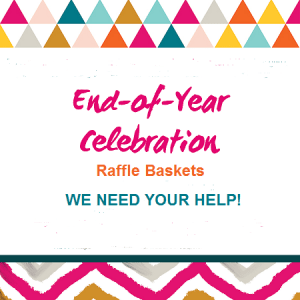 ♦ Year End Celebration – Raffle Baskets. WE NEED YOUR HELP! We are continuing to collect items for the baskets. Please click on this link to read more about how you can help, and how the raffle baskets will benefit Suzy Lepeintre’s charity – Camp Kesem and the Bellevue College community. Remember your names will be added for the Arts & Humanities raffle when you donate $$ or items. ♦ Do you have information to share that you think might benefit your division colleagues? 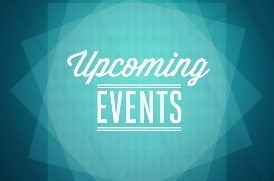 The weekly A&H Digest features a new section “Faculty Resources,” for disseminating informative articles, workshops, and other events of specific interest to faculty. Please send all info to: Janis Juarez. ♦ Wednesday, May 17, 2017 | Student Art Walk – For more details, schedule and map visit the Student Art Walk web site. ♦ Monday, May 22, 2017 | 7:30 pm, Carlson Theatre – Spring 2017 Jazz Band Concert, directed by Jim Sisko. Shenandoah Conservatory Jazz Ensemble performs | Tickets through Brown Paper Tickets. 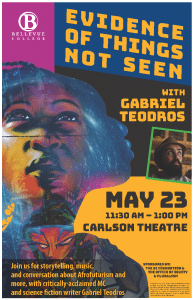 ♦ Tuesday, May 23, 2017 | 11:30 am – 1:00 pm, Carlson Theatre – Evidence of Things Not Seen: Storytelling, Music & Discussion with Gabriel Teodros. Read more about this powerful performance. The entire BC community is invited.